The ways scientific research is conducted and its results are taken up are undergoing radical changes as a result of the digital revolution. Researchers in all disciplines are increasingly adopting digital tools, techniques and practices in communities and projects that span multiple disciplines, laboratories, organizations, and national boundaries. The e-Science 2015 conference is designed to bring together leading international and interdisciplinary research communities, developers, and users of e-Science applications and enabling IT technologies. The conference aims to serve as a forum to present recent research advances in e-Science and highlight associated activities worldwide, providing an outlook of challenges and opportunities we will face in the future. 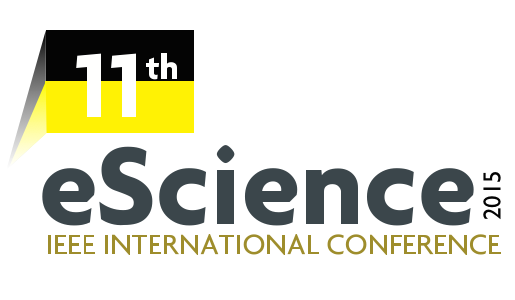 e-Science 2015 will follow the previous e-Science conferences in encouraging submissions that explore advances in the application of technology in particular disciplines, covering both data-oriented and compute-oriented approaches, as well as extreme scale approaches and applications. Authors are invited to submit papers with unpublished, original work of not more than 10 pages of double column text using single spaced 10 point size on 8.5 x 11 inch pages, as per IEEE 8.5 x 11 manuscript guidelines. Templates are available from http://www.ieee.org/publications_standards/publications/authors/author_templates.html. Authors should submit a PDF file that will print on a postscript printer to https://easychair.org/conferences/?conf=ieeeescience2015.